Our weather this week has changed from sunny, but cold, to cold plus snow, to warmer and rain with fierce winds. Today was no day for picture taking so this mosaic is from the sunny but cold day last Sunday. 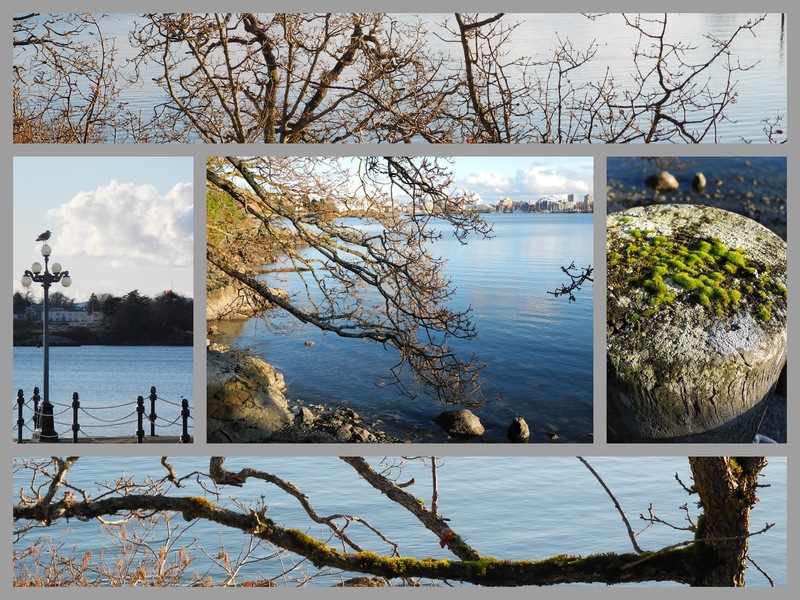 The Westsong Walkway begins in Victoria's Inner Harbour at Songhees Point and continues along the water to West Bay, curving around small bays and jutting rocky points. The wind today made for an interesting experience in church this morning. Our pastor was speaking about technology and about how easy it is to connect via the internet, Skype, texting, or whatever, and suggested that every once in awhile we just need to take time to disconnect from technology and connect with people face to face. At that very moment, the lights, power, sound went out - no electricity. It was a total disconnect from technology that made me wonder if he had planned it! So we went out for coffee with friends and connected face to face. Connecting (or linking) to Mosaic Monday, hosted by Mary at the Little Red House. that is just fabulous! I'm glad you took advantage of the power being off! Your mosaic is just beautiful...what a wonderful and inspiring place! That is amazing. Like it was meant to be. Except for the wind, it looks like a pretty day to be outside. Beautiful scenery and lovely mosaic. Beautiful mosaic. Synchronicity and electricity! :D :D I think we should disconnect .. often! Beautiful images. The weather has been crazy everywhere it seems. I think what happened at church, planned or unplanned is a sign - to disconnect once in a while. Hi Lorrie, We have crazy weather also. Friday it was in the high 50's, sunny, and felt like Spring. Saturday we woke up to 1 /2 inches of well needed snow. After that we got rain. Well, it is January. I've kind of forgotten because it's been unusually warm. The power outage was definitely appropriate. God works in mysterious ways! What remarkable timing! I bet the pastor was surprised too. The scenery is beautiful in your part of the country, Lorrie. take care..just heard power out to many on Vancouver Island..
Talk about an object lesson . . . interesting the way that happened. That's a favorite walk of mine - and I love to end it with fish and chips! I loved the story of your pastor's message today, and the postscript to that message! Lovely pictures Lorrie...face to face is a great place to be. :). Have a great week! Fabulous mosaic, you've captured the changing scenery perfectly. Again, I love your mosaic! And I love that walk, whenever we visit Victoria. Power stayed on here, but we did slow down, huddled inside, amazed at the winds. . .
A forced disconnect is a good thing once in awhile! We had several of those here last week...but it was not a good thing. Beautiful photos...love your mosaic! Your area of the world is truly gorgeous. Your mosaic is very special - I love the picture of the seagull on the lamp post. Of course I wish I was able to walk there along the water, but not on as stormy day as it was yesterday. Have a good week Lorrie ! Beautiful mosaic, Lorrie! Stormy weather can be as alluring as nice weather at times. I agree it is nice to have a day without technology -- I often do that on the weekends. Lorrie, I can't tell you how many times your postings have made me pull up a Google map to see just where it is that you are writing about. Beautiful photos of a really pretty area! I learn a lot from coming to your blog....thanks! p.s. Yes, please DO make your DH a Lemon meringue pie next week? He'll thank you for it! Beautiful photos as always, Lorrie! I don't think we, here in TX, are going to get a winter at all this year. Cue the music! Well, I think you've been doing a lovely job of disconnecting this week and I hope that you've enjoyed a wonderful one. Something makes me think that you might also be very busy with moving upstairs. Beautiful mosiac, Lorrie. Your eye for form and color is right one. This is such a lovely mosaic!